After the major success of Duke Nukem 3D, third­party companies started to crank out expansion packs, and Duke Xtreme, developed by Sunstorm Interactive and released by WizardWorks in 1997, was one of them. Removing the E from its name may deceive gamers into thinking this add-on is COOL and RADICAL! Unfortunately, deliberate misspelling could not save it from being a poor quality, cheap cash­grab. Focusing on the maps first, many of them stink. Consisting of twenty­five maps for single player and another twenty­five for Duke­match, most of them were downloaded from the internet. Levels include an ugly convention, a big and ugly ice planet, and a even a disco map that consists of nothing more than a big square with four pillars and flashing lights. However, there are some small nuggets of fun here, for Duke Xtreme does have some well­ designed levels, some of which just lack difficulty. Duke Xtreme also offers some new alien bastards for our hero to duke it out with. The King Cobra is a nuisance for it bounces around, spamming players with pools of acid spit and laser projectiles, which is a particularly unfair attack. Duke knows there can be only one king, and can dispatch it with just a few shots. If you feel like going bananas, then prepare yourself for some monkey business when you come face to face with the Gorilla Commando, who fires streams of bombs from his mortar. This hairy fella acts like a mini­boss, and has a tendency to spam a bit, especially in comparison to the chaingun and mortar­ equipped mini­ Battlelord, but he is nevertheless a worthy addition to the enemy ranks. As for weapons, the knife, silenced Uzi and red Devastator are merely sprite­ swaps. Strangely, the mighty knife (which replaces the mighty boot) makes Duke look like he has grown a third arm. Some guns have new firing modes, too. If players hold dow the space bar whilst firing the RPG, rockets will produce a trail of colourful explosions for more damage. It’s not particularly satisfying to use and it feels too overpowered. Also, the supercool Freezethrower has a new alternative attack, dubbed the Statue Maker, which turns foes to near ­indestructible stone statues. Again, it’s not very useful for the statues merely end up blocking off passages. Despite not including any new music tracks, it comes with a simple and easy ­to ­use statistic editor, which can modify the game in wacky ways. For example, health and damage statistics can be altered, water fountains can be turned red, and enemies can float away as a ghost on death and explode. 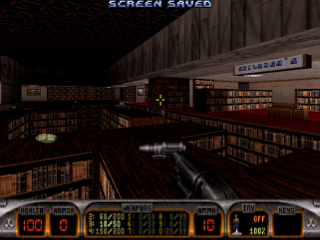 Players can even choose which of the new levels they want to play in any particular order. These tools are a very interesting feature for those who want to add some strange twists to the game­play, and the launcher runs perfectly fine on DOSBOX, but modern source ports cannot get this old school editing software to work. Clearly, they just aren’t ‘xtreme’ enough. Duke Xtreme does have a small handful of good maps to try out. However, it is burdened by some truly pathetic levels. The new enemies and modding tools are an interesting inclusion, but the alternative firing modes are just a nuisance to use. On the whole, Duke Xtreme really isn’t too ‘xtreme’. Perhaps if it named itself ‘Duke Xremely Medicore’, that would have been a more accurate name to sum it all up. Still, if you can bag yourself a mint­condition copy with the Duke Xtreme shirt that it came packaged with, it’ll make a nice addition to any collection.